Normally if a supermarket renovates its interior, I wouldn’t take enough notice of it to write a whole blog post about it, but this is different. 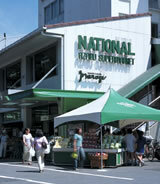 National Azabu is a fixture in the expat community of Tokyo and in 2011, it closed, razed to the ground, and rebuilt. It just opened in August 2012. So why, less than 3 months later, is it closing for a couple of days for renovation? The answer is to respond to client demand. The people who shop there have been complaining that the new layout is confusing and not intuitive. It’s difficult getting through the aisles. So people complained and the “powers that be” are responding. But there’s more. The supermarket is closing in part for two days to re-vamp the whole thing, and they’re so concerned about it that they’re offering a special sale to make it up to customers. In addition, the postcard I got in the mail announcing the disruption in service has a little man on it who I am positive is looking down at the ground saying “gomen nassai” – apologizing. This is yet another thing I love about Japan. Customer service second to none. In Ginza, When is a Mannequin not a Mannequin? This was the window of Furla, the upscale Italian handbag shop in Ginza two weeks ago. There was a crowd of people around it! I peered through the throng just staring at the window, and then, lo and behold, the mannequin moved. It seems that Furla had hired live women – models – to show off their handbags. There were four women in total, each more beautiful and still than the last. When they moved, it was just a slight position change so that shoppers wondered if it had happened or if the window was playing tricks on them. I didn’t watch for too long, but it was just so fun and interesting – and wildly creative. I wonder how many more bags Furla sold that they might otherwise not have. aimeeweinstein	. Japan, Shopping	. Costco, Japan, U.S.
A few weeks ago I was in the U.S. celebrating my grandmother’s 90th birthday. When I’m there, I like to stock up on things I don’t get in Japan – a few things like my hair products, some American-style medications, and some paper goods. I thought it would be a good idea to go to Costco near my parents’ house to get the stuff. My mom thought it was a great idea and gave me a few things to pick up while I was there. There were a total of perhaps ten items on the list – not very many at all for a Costco trip. I got there and managed to maneuver my dad’s little convertible into a parking spot far from the building. I noticed that people tended to hang around cars parked close to the entrance that might be leaving in hopes of snagging their parking spots once they left and to me, that’s a waste of time, so I just parked pretty far and walked right inside. Once inside I took a deep breath. I do go to Costco in Japan, but only about once every six or eight weeks or so. And like most things that are in both the U.S. and Japan, the Japanese version is slightly different from the American version. For example, the American ceilings are much higher, the whole place has bigger square footage, and it’s noisy. In Japan, it’s quieter, but more crowded. I know that doesn’t seem to make sense, but somehow there can be crowds and quiet at the same time here; Japanese are pretty quiet people. Well, the Costco in Boynton Beach Florida was nothing like my Costco in Kawasaki, Japan. I got about halfway through the list and couldn’t find the batteries my mother needed. I couldn’t find the tissues either. It seemed like a huge trek to go back to the other side of the building to look on the right side when I was already all the way to the left. There was music playing in the background and a ton of people talking loudly. The worst part of going back to the U.S., I find, is how many conversations I can overhear. I don’t speak enough Japanese to always understand everything around me, so I often live inside my own head. All the noise is incredibly distracting. What did I do? I panicked. I found it hard to breathe. I trembled. I fumbled for my phone and dialed my parents’ house. “Mom, I can’t do it!” I cried, rooted to the spot. My mom, to her credit, just went with it. “Just drop everything and come home. We’ll go back together tomorrow,” she said. She encouraged me to just take a deep breath and get out. Well, that did it. I hung up the phone and took a deep breath. Right then, a Costco employee walked right past me and I flagged him down. Bless him, when I asked him for the 3 items still on my list, he just took me to find all 3. With every item on the list ticked off, I braved the check-out lines. Of course the check-out lines were no mean feat; they are never fun. But I closed my ears and just waited until my turn. 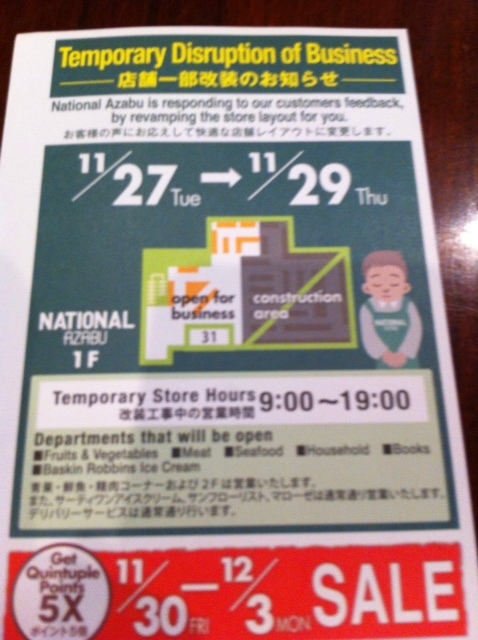 Luckily they had self-checkout, a great invention that has not yet made it to Japan. Those lines are always shorter. I was out in record time and at my parents’ house not long after. My mom was surprised that I was able to get all of the items after all. I told her it was a matter of self-management, and not panicking. Japan and the U.S. are different, even when the store name is the same. No reason to panic.